In order to create a more transparent and informed election, SURJ-SD has administered a racial justice survey to the candidates in the San Diego races for mayor, city attorney, and city council (districts 1, 3, 5, 7, and 9). 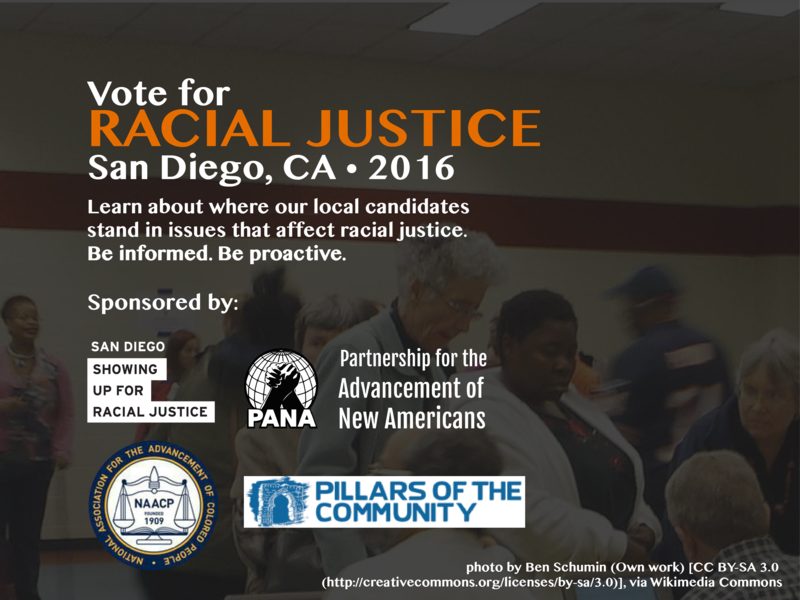 SURJ-SD invited all candidates to complete a 15-item questionnaire* that has been endorsed by the San Diego chapter of the National Association for the Advancement of Colored People (NAACP), Pillars of the Community, and Partnership for the Advancement of New Americans (PANA). Almost half of the candidates (13 out of 29) completed the survey. Responses are reported in full for each candidate below. We have also highlighted candidates’ positions on four key issues: the concept of race, the Black Lives Matter movement, the San Diego 33 arrested under California Penal Code 182.5, and San Diego’s role in the current refugee crisis. For these topics, Pillars of the Community, SURJ San Diego, and the NAACP have provided their perspectives as community organizations committed to creating a more equitable San Diego. We are grateful to the candidates who took the time to complete the survey in order to better inform the public about their racial justice track records and agendas. We are disappointed that more candidates did not respond, but we hope that this project contributes to a citywide conversation about racial inequality in San Diego. SURJ-SD does not endorse any particular candidate. We believe that elected officials should be informed about and committed to the issues affecting San Diego’s communities of color. The survey was developed by SURJ-SD in consultation with members of the San Diego chapter of the NAACP, Pillars of the Community, PANA, and the Chicano Park Steering Committee. On April 30th, all officially registered candidates were invited by SURJ-SD over email to complete the survey. Candidates were contacted through the email addresses they provided to City Clerk’s office. Participants were asked to complete the survey by May 13th, and reminders were sent to active candidates who had not yet responded on May 4th, May 11th, and May 13th. All questions on the survey were optional, and any question left blank was interpreted as “I choose not to answer this question.” Candidate responses are reported verbatim with minor spelling and grammar edits made for clarity.